There is a clear connection between good content and search engine optimization (SEO), however, how much video affects SEO is something that is often overlooked. Ranking doesn’t only rely on the form of content you create (video, written, image, audio) but you can optimize your content mix to make your website more visible. Because video has been proven to be in favor by the search engines (especially since YouTube is owned by the mother of all engines, Google) Video is one of the strongest signals you can give to the search algorithms to improve your ranking and visibility. So, if you want to rank your website higher on the search engine results page (SERP), it’s worth taking a second to understand how video affects SEO and why. Here’s what you need to know. Why do videos have an effect SEO? It all has to do with Google. Way back in May 2007, Google launched “Universal Search,” an update to its appearance which featured blogs, images, shopping sites, business websites, and videos all on one SERP. At the time, it was revolutionary. It meant that any link that leads to relevant content with the appropriate keyword could now compete for visibility and a higher ranking. And algorithms that defined crawler (search bot) behavior favored websites with video content because videos can drive brand awareness and conversion and add value to the user all at the same time. Of course, with every new algorithm release and the massive amount of videos uploaded to the Internet, this has slightly changed. But the principle remains the same: a site page will rank higher if it has a video. 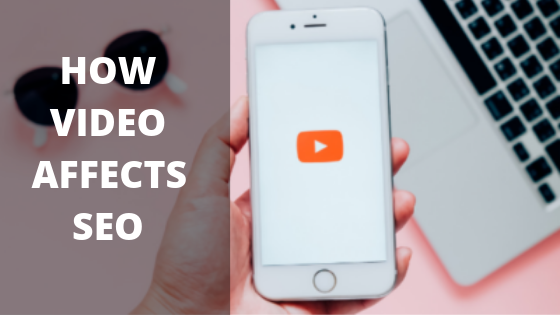 How do videos affect SEO? People love to watch videos. In 2017, videos were responsible for 74% of all traffic volume. And as users generate more traffic, unique visits, and spend more time on sites watching videos, Google’s search algorithms like the Hummingbird Update see it as quality content and move the rank of an entire website up the SERP. Watching videos is also more comfortable than reading. Our brains are wired to process visual information 60,000 times faster than reading a text. It means we are also four times more likely to watch a video to learn something about a product. And when users see a video on a SERP and click it, it boosts CTR, which has a cascading effect that causes the rank to go up again. If you have a video on your website or landing page, users will spend twice as much time on it than if you didn’t have one. It signals to Google that content on your website is highly engaged to users, so it ranks it higher on the SERP. Entertaining, informative or educational, create a lot of hype because they appeal to people. Their value raises their shareability, which means users, as well as websites, will report on the video to a broader audience. And everytime someone leaves a link back to your site Google sees it as an authority and boosts your ranking. So, when people wear out the Bill Gates’ phrase “Content is king,” it’s for a good reason. But if the content is king, then that means the video is its strongest subject. And using SEO for video content can only make it more effective, and your company more successful.